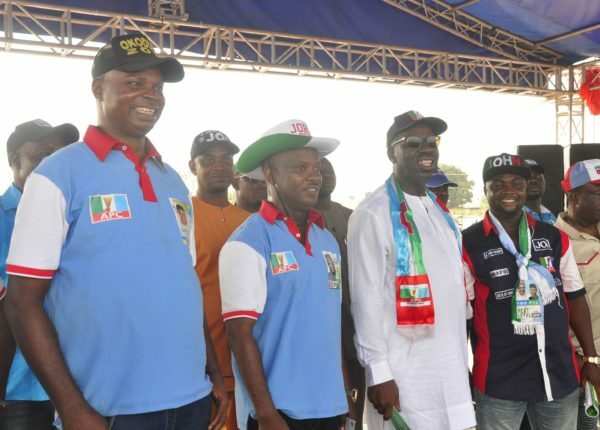 Less than a week to the 2019 general election, Edo State Governor, Mr. Godwin Obaseki, has charged voters in Oredo Local Government Area to come out en masse to vote for candidates of the All Progressives Congress (APC) seeking to represent the people in the State and National Assemblies. “The issue is very simple. Do you want to go back or go forward? My message today is simple: I just started to work in the state and if you want me to do more, you must vote for APC candidates to support me at the Senate and House of Representatives. I have gotten approval to do the Benin River Port, so I need strong people to represent us in Abuja,” he said. While urging voters to support the APC candidate for Oredo Federal Constituency, Hon. Osaigbovo Iyoha, Obaseki said Iyoha has assisted him in actualising the Edo Basic Education Sector Transformation (EDOBEST) programme while serving as member of the Edo State House of Assembly. APC Senatorial candidate for Edo South, Hon. Patrick Obahiagbon, according to the governor, is also a trusted ally and a public servant who is ready to attract development to the state. Minister of State for Health, Dr. Osagie Ehanire, said voting for APC candidates in the forthcoming elections translates to voting for better things to come, noting, “President Muhammadu Buhari has done a lot in the last four years; we are no longer importing fertiliser and now import only 10 per cent of rice. The president wants to spend Nigeria’s money on Nigerians, so let us vote for him.” Other APC candidates seeking seats in the Edo State House of Assembly to represent Oredo LGA include Oredo East Constituency candidate, Osaro Obazee, and Oredo West Constituency candidate, Christopher Okaeben. Chairman, Edo State Chapter of the APC, Barr. Anselm Ojezua, assured that the party is fully prepared to participate in the 2019 elections, adding, “We want to retain power and the only way to show that the governor is working is to vote for all APC candidates that will support the governor to achieve greater success.” The chairman also received decampees from the Peoples’ Democratic Party (PDP) and other political parties who pledged to ensure victory for the APC at the polls. Chairman, Oredo LGA, Hon. Evbareke Jenkins Osunde, who welcomed the governor to the APC rally, said the residents in the council are happy to have benefitted from programmes initiated by the Obaseki-led administration. we'be heard & we'll keep that at the back of our mind.